'While we may aspire to be a democratic if smaller version of China, we may only manage to become a larger, more accomplished Indonesia,' says T N Ninan. It has become obvious that comparisons between India and China make less and less sense. Though both are geographically large and populous, and are firmly positioned as the two fastest-growing large economies, they have been on different economic growth trajectories for four decades, such that the Chinese economy is now five times India's. China is in another league in the power game while India is losing traction in its own neighbourhood. China is increasingly more accomplished when it comes to technology acquisition and absorption, quality of education and the elimination of poverty, and (most importantly) is better organised to deal with its challenges. These gaps are reflected in how the pursuits of the two countries are now very different. China has an impressive weapons manufacturing programme, while India remains stuck as the largest importer of defence equipment. While Beijing moves confidently to master the elements of the fourth industrial revolution (materials, technologies, production methods), India struggles to make a success of the low-wage export success stories of China's past. While China is the world's leading exporter, and some of its companies have become world beaters, India's much smaller share of that trade is diminishing. It is not that India does not have its own successes to showcase, but the two countries are now in different economic and power orbits. So perhaps the time has come to shut down the cottage industry that compares the two countries -- an industry that, let it be noted, thrives more in India than in China, where their eyes are set on challenging the US. If comparisons have to be made, why not pair India with Indonesia? 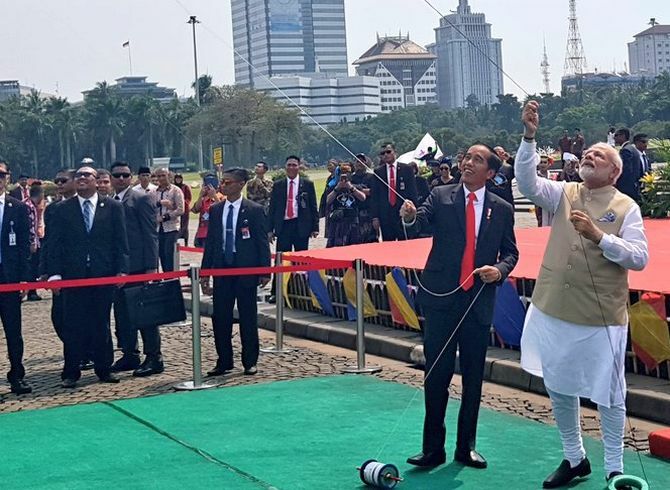 Doing so may offend our self-image as a great power in the making, and the comparison is unfair to India's many and varied accomplishments to which Indonesia has no answer. But, on the key criteria, Indonesia is a better fit than China. It is a trillion dollar economy with twice our per capita income ($4,000), which we could hope to reach by 2030. China's $8,600 is for India beyond the horizon of meaningful projection. Indonesia also has a respectable economic growth rate of 5 to 6 per cent (faster than India in one recent year). Its population is large though only a fifth of India's, and the two countries have a similar rate of population growth (1.2 per cent). The two economies are run on similar lines. Both have a large public sector, and are given to imposing price controls instead of allowing markets to function. Both countries have been on a reformist path, and have opened up more to foreign investment. Both have similar country credit ratings, though India scores with superior macro-economic indicators. Indonesia is ahead on other fronts: It has a higher World Bank ranking on Ease of Business, and a better score on corruption. Social trends in one country mirror those in the other. Though India is predominantly Hindu and Indonesia mostly Muslim, Indonesia too has been considered a society that was by and large tolerant about ethnic and religious diversity. Separatist movements have been a longstanding problem in both countries. In recent times, religious divisions in both countries have created increased tensions and violence. Indonesian society, like India's, has seen the growth of religiosity (many more women wearing the hijab). While India has shifted its political centre towards Hindu majoritarianism, and witnessed creeping institutional control by the Rashtriya Swayamsevak Sangh alongside the proliferation of vigilante groups, Indonesia has seen the creation of a religious police, conservative clerics who have set themselves up as moral arbiters, and the spread of Islamic State. There are differences, of course. Indonesia has seen bigger political upheavals and sharper economic disruptions, and its democratic record is relatively recent. On the economic front, India is poorer, but its industrial and financial sectors are more varied and developed. But both have similar development challenges: Industrialisation, the development of infrastructure, addressing large inequalities, and tackling poverty. So while we may aspire to be a democratic if smaller version of China, we may only manage to become a larger, more accomplished Indonesia.